I just got this great folding shovel by CLD brands. This is a great shovel if you are a hiker, camper, or just to have in your vehicle in case of emergency. It folds up and fits in the included bag that makes it easy to travel with. I pop mine in the car to have if I need it and when we go camping I always bring it along for that as well. It’s super convenient to bring along and takes up very little space in your backpack or car. You can use it as a shovel or you can also lock it in place and use it as a pick axe. It’s a great tool to have on hand in an emergency or just for camping. I don’t know how many times we got to our campsite and needed a shovel or pick axe to put up our tent. It is really convenient and nice to have on hand. We use ours all the time. It’s made of a great sturdy material and works really well. It’s not going to break or fall apart on you. It’s sturdy and well made. We have been using ours for awhile now and we love it, we have had not problems with it at all. It works really well and does what we need it to. PREMIUM QUALITY: This is the best mini foldable compact tool with multi-purpose use on Amazon. Ideal for the on-the-go adventurist, camper, hunter, hiker, cyclist or mountain climber. Wrought iron design, makes it durable and firm. FOLDED measures 6 inches long. UNFOLDED measures 16 inches long. BONUS: Bonus Survival Guide sent electronically and nylon camouflage carrying pouch. Comes in a box making excellent for gift giving. RECOMMENDED USES: Great for camping trips, hiking, mountain climbing and cycling. How about take it along on the hunting trip. Perfect for the garden or to dig holes and set up camp. How about a winter survival emergency kit for the snow sledders, skiers and those who get stranded on the road and need to make it through the night. 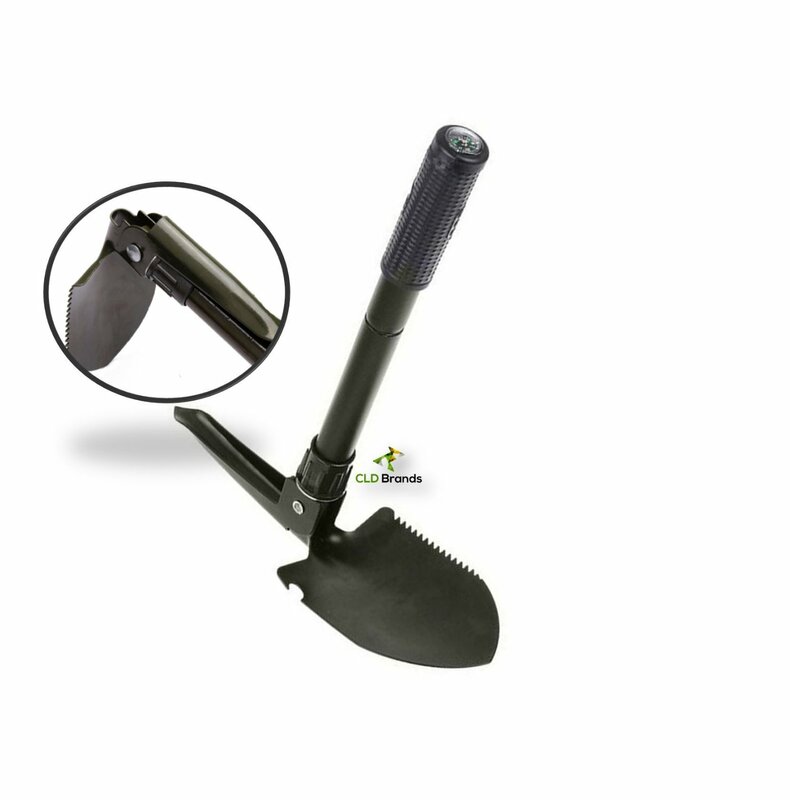 Make it the best Father’s Day, Birthday, Christmas Gift or any day by handing them CLD Brands Folding Pick Shovel. TRAVEL MATE: This is the best pick shovel on Amazon and comes with a carry pouch that makes for easy carrying and transporting to your outdoor adventure. Hooks easily on you belt or you can use the wristband to keep it secured. It’s compact size makes it easy to put away and store when not in use. It’s compact, lightweight and multi-purpose. Keep it in the garage or in the car for easy access. Your choice! 100% SATISFACTION GUARANTEE: When you purchase from CLD BrandsTM your satisfaction is guaranteed. No HASSLE, No QUESTIONS. It’s that simple! If for any reason you are unhappy with any product by CLD BrandsTM, please do not hesitate to contact us. We take full ownership and responsibility for the quality of our products and will do our very best to solve your problem quickly and efficiently. You can purchase this shovel on Amazon!